Ekornes combined beauty and comfort when designing the stunningly exquisite Stressless You James Recliner and Ottoman. The Stressless You James Recliner and Ottoman by Ekornes is designed with full support and comfort in mind. 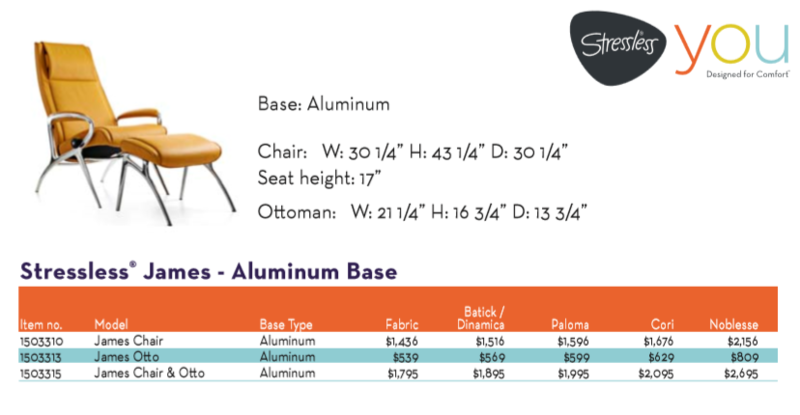 The beautiful aluminum base helps it become one of the more exquisite and modernly fresh Stressless Recliners available. Some of the amazing features of this recliner include its ability to fully support the neck and back when reclined and it can also be adjusted to the perfect angle for maximum comfort. The Glide Wheel Mechanisms on the sides of the recliner can be tightened or loosened to hold the angle of the recliner in place. Inside the top of the back cushion of the Stressless You James Recliner is an insert where an adjustable pillow can be found. This pillow can be moved either up or down to help assure maximum neck support while relaxing. While reclining in the James You Recliner, the back cushion moves with the body, not against it, which helps assure full lumbar support and comfort. The aluminum base of the Stressless You James Recliner really helps it stand out in a field of fantastic and comfortable Stressless recliners and ottomans. The design is very modern with a retro twist. The Clean Nordic lines and urban design could only be compared to a true Norwegian Masterpiece! It's a great time of year to purchase the beautifully designed Stressless You James Recliner! Now make your preferred leather or fabric type and color selection by simply using the pull down menu above, which is titled: "Select Leather or Fabric Type and Color". Our dedicated team of Customer Service Professionals will typically contact you within 1 business day of placing your order of the Stressless You James Recliner and Footstool. They will verify your shipping address and order information. Want to make sure you are getting the absolute best price and saving the most money? Ask our Customer Service Team to run a double check. If they find any eligible savings available, they will gladly apply them to your order. Our #1 goal is your 100% Satisfaction. It’s one of the many reasons we are proud to offer a 30 Day Satisfaction Guarantee. If you aren’t satisfied with your purchase, we aren’t satisfied. Ekornes designs furniture that fully supports your back and neck. That is why all of the Stressless Recliners and furniture are endorsed by the American Chiropractic Association as healthy back furniture. Still have questions about the Stressless James You Recliner and Ottoman or need more information about any of the other amazing furniture by Ekornes? Call 888-486-9463 to Speak with a Stressless Sales Specialist, as they can answer all questions and help find the perfect Stressless Furniture for any home, office, or living space.